From my own perspective, I was greatly impressed with it. However, I am a comic book nerd who knows the gospel of Mark. There have been other attempts to reimagine religious narratives in graphic novels and some have been more successful than others. For example Deepak Chopra and Shekar Kapur’s Ramayan is an artistic delight and authentically manga experience. However, the Bible is usually given the well meaning but saccarine 60’s pastel shades of the ghost of sunday school past. Even the artistic talents who worked on Judge Dredd seemed heavily influenced by the images of their childhood. Marked however has no such hangups. This really does look like it belongs up there with Judge Dredd. The art work is really good. Mark’s Gospel has been placed into a futuristic post apocalyptic setting that intrigues the reader to carry on. I have only a couple of concerns. What is it for? It doesn’t follow a true enough course to the Gospel itself although it does make you want to ask more questions. Is this a springboard into the text for someone who has never really encountered the biblical narrative or is it a thought provoking encounter for people like me who have a good knowledge of the original? Is it both and at the same time actually neither? Hmm. Interesting review – thank you. 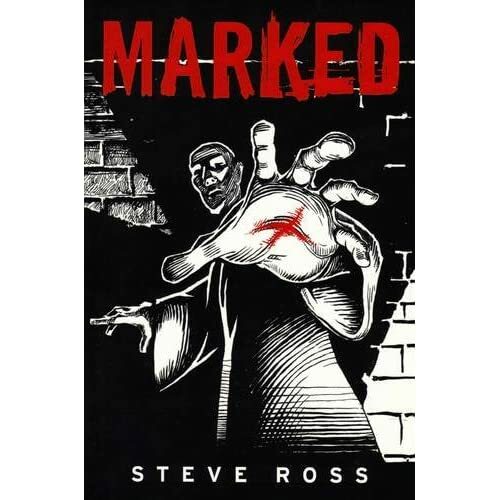 I’ve just finished my first read through of Marked, and posted a short review. Like you, I’m familiar with the gospel. I liked the work – some of the concepts were clever – I liked the blind people particularly. I also though the themes of control and oppression by the ruling government were good. I think perhaps the book would be best suited to late teens who have a knowledge of the Gospel but who struggle with the immanence of the text and the cultural context of Jesus’ life. I think bringing those alive is what Ross does best.